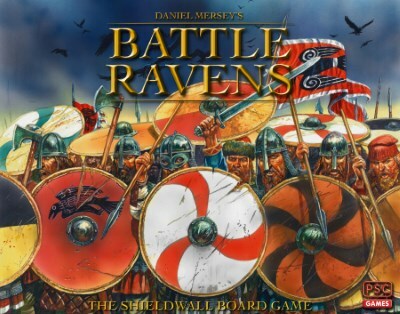 "Battle Ravens is a game of Viking Age warfare: a brutal clash of strength, cunning and luck, where subtlety and nuance are neither welcome or commonplace. You need to out-think and out-fight your opponent to win the battle. You do so by choosing whether to command your battle line to attack, defend, or redeploy, through clever use of action points. Combat is resolved by the roll of dice, and armies consist of Hirdmen (armoured warriors), Bondi (unarmoured warriors), and Thralls (cowardly but useful skirmishers!)"